Mini Playroom – Before and After! So I love our house – I have since the minute I walked in it. We never had a problem with space before a baby…but they tend to cause that. 🙂 In the past month or two, we have been in DIRE need of some kind of play area. Baby “stuff” is overwhelming our house, and I just need a place to contain it. We briefly talked about turning our third bedroom into one, but there are two problems with that – we have a full bedroom suite in there that we would have to move, and we are basically never in that area of the house. Which is also why we don’t keep Emma Ramey’s toys/things in her room…we’re just never back there, and it would be pointless to pull everything out every day just to put it back. 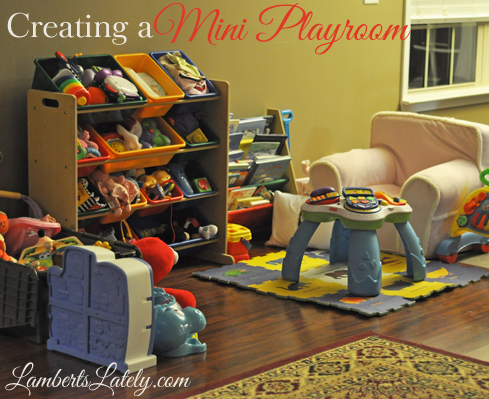 We have a fairly large living room, so we decided to make a section of it a mini-playroom! So far, so good with it being functional. It’s in an area I can watch Emma Ramey whether I’m in the kitchen or the living room, and she’s away from furniture she can pull on herself. Here’s what we were working with before. Emma Ramey got basically all of this for Christmas. I like having it contained to one little area. So, last week I ordered a few little thing to really make the area complete! I used her Anywhere Chair and the “toy box” (storage box for now) as kind of a partition for the area, for two reasons. One, it makes that area of the room feel a little bit more secluded and away from the rest of the living room. Two, the fireplace is right behind the “toy box” – she constantly tries to pull down that screen, which scares me to death, and this keeps her away from it! So far she hasn’t gone near it. My favorite parts are the toy organizer and the bookshelf I found for the area! They are kid friendly and were not very expensive. The only thing that isn’t in is the play mat for the area. She got the Eric Carle one that is there right now for Christmas, but it isn’t nearly big enough. The one I just ordered from Zulily should fit just right! They are supposed to be here tomorrow – I’ll update with a (good) picture if I can. We also want to eventually get a blanket chest for a coffee table instead of that not-so-pretty storage bin we’re using as a toy box. Knocks out two birds with one stone – acts as a toy box, and keeps Emma Ramey from crawling underneath the table! I am so excited about the area! It is so functional, and I feel like we’re going to enjoy it for a long time. I’m linking up with Kelly today…go check her blog for more organization tips! Don’t forget – you can see my Boudreaux’s/BlogHer $100 Visa card giveaway here!